HomeBreedsJack Russell Chihuahua Mix: Is This Tenacious Terrier The Dog For You? The Jack Russell Chihuahua mix is most commonly known as the Jack Chi. They are energetic, intelligent, loving and loyal. Despite their small stature, they have huge personalities, not unlike their parent breeds (the Jack Russell and the Chihuahua). The Jack Chi is not a dog that requires constant attention, but they do need a good amount of exercise. If you take the plunge with them, this little guy is sure to reward you with endless love and entertainment. 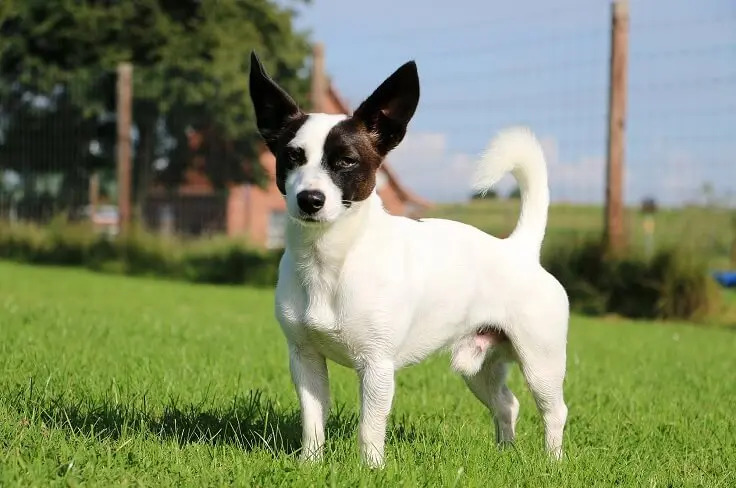 In this article we cover everything you need to know about the Jack Chi, so you can figure out if this tenacious terrier is the dog for you. Is A Jack Russell Chihuahua Mix A Good Family Dog? How Much Do Jack Russell Chihuahua Mixes Cost? The Jack Russell Chihuahua mix is a cross between a purebred Jack Russell and a Chihuahua. 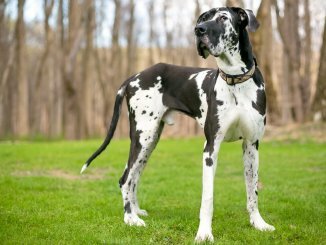 They are a designer dog breed first crossed in the United States. This mix is most similar in classification to their Chihuahua parent, who is classed as a toy dog. The Jack Russell was originally bred as a working dog but is much more common nowadays as a companion dog. As this breed is a cross breed, it’s not recognized by the American Kennel Club. They can be quite sensitive to the cold and may not be suited to a home with young children due to their small size (more on this later). As for exercise, they need around half an hour to an hour each day and lots of mental stimulation in the form of toys and play time. The Jack Chi is a mix of two small dogs so you can guarantee it will also be small. Being a mix of two breeds, each puppy will be slightly different depending on what characteristics it inherits. 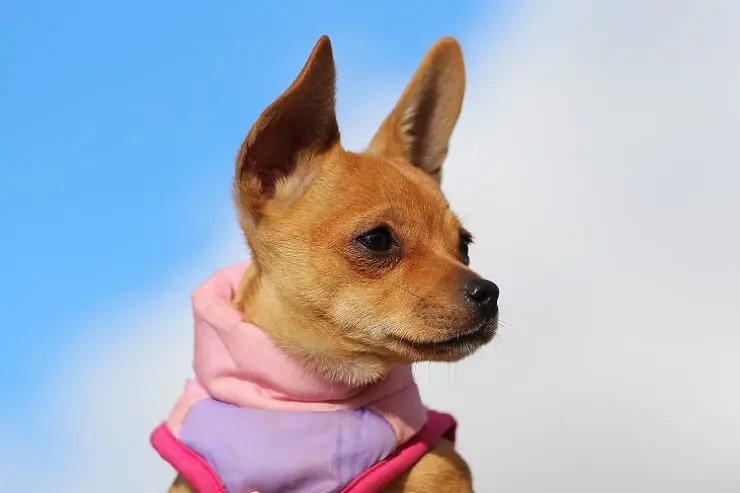 They will generally have a short, shiny, wiry coat but sometimes it can be longer if the parent Chihuahua has a longer coat. Most likely your Jack Russell Chihuahua mix will have the large round eyes of the Chihuahua on the Jack Russell’s triangular shaped head. Their face is long and terrier-like but probably thinner than the Jack Russell’s face. They may have erect ears like the Jack Russell or floppy ears like the Chihuahua depending on which they inherit. Their tail will likely curl upwards like the Chihuahua. We think this breed is going to be adorable no matter which characteristics it inherits! When fully grown, they will be around 10 to 15 inches tall and weigh between about 8 and 18 lbs. This is a very small dog and because of this, there may be issues regarding handling and feeding (more on this later). Their coat is most often white, black, cream, dark brown or golden. They can have patches around their eyes and, like their Jack Russell parent, can be tri-colored (an interesting mix of three different coat colors). You can expect them to have a short, shiny, wiry coat that is quite dense. Sometimes, if the Chihuahua parent has a longer coat they may inherit this trait. If so they may shed a little more. This dog is an energetic, playful, intelligent, loving and loyal dog. Both parent breeds are well known to be characterful and the mix is almost certainly going to create a unique character too. As this is a cross breed, it will inherit different traits from each of its parent breeds. The Jack Russell Terrier was originally bred as a working dog in England. They were bred to hunt foxes and their small size meant they could fit down foxholes. This little dog is extremely high energy and eager to please. They are very friendly but need regular socialization and training from a young age. They often want to rule the roost but consistent, positive reinforcement training should help them to understand who is boss. The Chihuahua is the smallest breed of dog, however, they have massive personalities. This little dog is full of sass and attitude. They have a tendency towards nervous, hyperactive behavior. As you can tell from its parents, this mix will need a good amount of exercise and lots of play. Barking is likely to be an issue with this little guy as they like to make themselves heard. Teaching them early in life that barking is not how they get their way will be very important. As long as they are socialized with other dogs from a young age you should have no problem with aggression. Puppy parties are always a good idea to teach them the polite ways to interact with other dogs and burn off loads of energy. 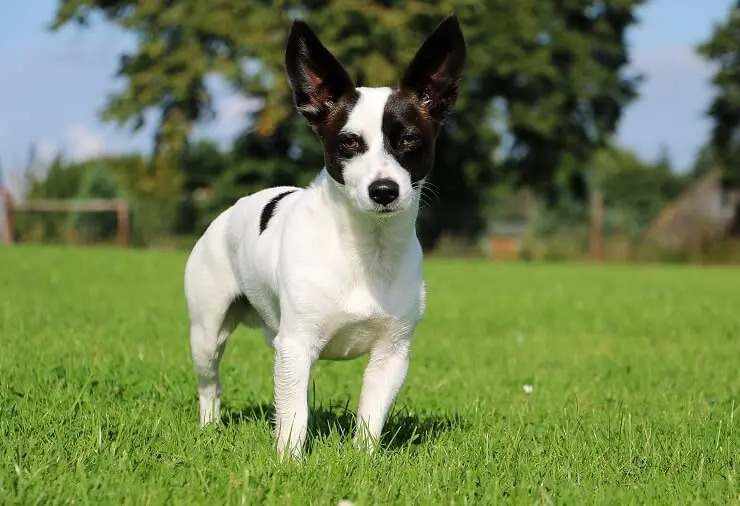 The Jack Russell Chihuahua mix is a very friendly breed and, although they will likely bond to one person, they will want to be friends with everyone. Due to their small size and fragile bones, they are not suited to the rough handling that may come with young children. Once children are older and able to learn how to behave appropriately around small dogs, they can be introduced to this breed. If you have young children, this may not be the breed for you due to their small size and fragile bones. Families with older children who are used to being around small dogs will be fine. This especially applies to the Jack Russell Chihuahua mix as they are very intelligent and eager to please. 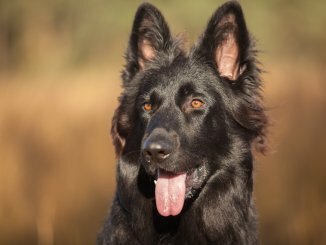 This breed can sometimes be a little picky with food so high-quality reward treats are important in training. Hopefully your pup will be food-focused as this makes training much easier. The Jack Russell part of this breed can sometimes lead to some inherited stubbornness. They like to be in charge! What is most important here is consistency, patience, and repetition of the same training techniques. Mental stimulation will be important in reducing negative behaviors such as barking and hyperactivity. Some Jack Russell Chihuahua mixes may enjoy agility training as they can jump surprisingly high. Socialization is very important for this breed too. Puppy parties are a great way of introducing your dog to the polite way to play and interact with other dogs. Exposing your dog to lots of people will also help with socialization. Older children can be socialized with this breed as long as they are taught the correct ways to play and handle a small dog. They can also chew alot, so be sure to provide lots of good toys to keep them chewing on things you want them to chew. Overall the Jack Russell Chihuahua mix is not a difficult dog to care for. They require around half an hour to an hour of exercise each day but this does not always have to be a walk. They do love to go out but they will also enjoy running around a garden or around the house. One advantage of this small dog is that you do not need to have a garden and they can live happily in apartments. Regular exercise will be the key to keeping on top of any destructive behaviors. 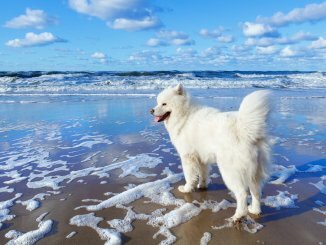 As for grooming, they will only need brushing once a week because of their short dense coats. They don’t require a lot of food and can actually be prone to being overweight so keep a careful eye on their diet. Dental problems may sometimes occur with this mix, so regular cleaning of your pup’s teeth is recommended. To make this easy on yourself, get them used to teeth cleaning from an early age, exactly as you would with cleaning ears and cutting nails. Use treats to make these activities fun and comfortable for you and your pup. Although this breed does need a lot of exercise, they will get a lot of what they need moving around their home thanks to their small size. They do love walks and we would recommend they are taken out at least once a day for half an hour to an hour. They can live in an apartment but if a garden is available they will enjoy time running around there too. This dog can be walked off leash if they have mastered recall, however, due to their small size and high energy, they can be easy to lose. Depending on your pup’s character, it may be easier and safer to keep them on a leash. As mentioned above, they may enjoy agility classes (this is a great form of exercise). We would not recommend swimming for this breed as they are very sensitive to the cold due to their small size. The Jack Russell Chihuahua mix usually has a short dense coat which means small amounts of shedding. Sometimes they can inherit a slightly longer coat from a Chihuahua parent which will mean slightly more shedding but still not a lot. Because of this, they will only need minimal grooming (brushing once a week with a hard bristled brush). This will be enough to keep their coat healthy and clean. As they are only a small dog, they do not need a great deal of food. Once fully grown, they will only need around a cup of high quality dry food a day. You can also mix in some wet food. Dogs require at least a quarter of their diet to be protein, so be sure to check the meat content of the food. Good quality dry food will not contain any food dyes, rendered fats, corn or wheat gluten. If they are particularly small (under 10lb) they may need a little less food. They may also need less food if they are not very active. Being small, they can be prone to being overweight as it’s easy to overfeed them. Make sure you keep an eye on their weight. Sometimes this breed can be a little picky so you may want to stick to what the breeder is feeding your pup if they are eating well. In terms of calories you should be aiming for between 250-500 calories a day depending on their weight. Being a cross breed they can have issues associated with either parent breed. One of these issues is allergies, particularly to long grass (they may come up in rashes). They are also prone to dental and eye issues. It’s important to make sure their teeth are cleaned regularly and that you regularly clean their eyes and ears. If your dog is not keen on teeth brushing then adding a dental treat into their diet is a good option. Other things to look out for are patellar luxation, deafness, hypoglycemia and heart problems. How Long Do Jack Chis Live? Jack Russell Chihuahua mixes can live from 13 to 15 years on average. When buying any puppy, your best chance of getting a good tempered, healthy puppy is by finding a reputable breeder. You should be able to meet both the parent dogs or at least meet the mother and interact with her. This will help you get an idea of what the puppy’s temperament will be like. You can ask if the Chihuahua parent is Kennel Club registered and ask to see documentation. However as Jack Russells are not recognized by the American Kennel Club you won’t be able to get documentation for this part of the mix. You should also ask for medical records from both the parents and a history of the puppy’s vaccinations, worming, and flea treatment up until the point you are collecting the puppy. Check the puppies yourself to see if they are clean in general, with clean eyes and ears. A really good breeder will not be desperate to sell you the puppies. They will want them to go to suitable homes, so expect them to ask you questions too. A Jack Russell Chihuahua mix will cost you between $200 to $750. 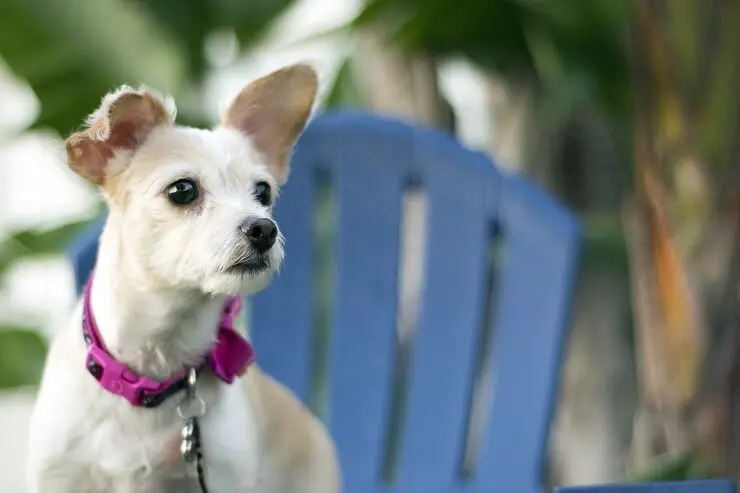 The Jack Russell Chihuahua mix is a beautiful little dog that would do great in a variety of living situations. Whether you live on your own or in a family with older children, or if you have a massive garden or just an apartment, this little crossbreed will be happy as long as it is with you. They are energetic, loving, playful, loyal little pups who will love spending time with you. They don’t require lots of care, only a good brush at least once a week and regular teeth cleaning, so would be well suited to someone requiring a low maintenance dog. If this sounds like the dog for you then you are sure to have many fun-filled years with them!